When I think about Thanksgiving I immediately think about giving thanks for everything I have to be grateful for over the past year. In our household we have always had a tradition of each of us telling everyone the one thing they are most thankful for from the past year. It's always neat to see what the kids have to say, and how it changes as they get older. That's actually what inspired me to expand the tradition to on a larger scale during our annual family Thanksgiving gathering. This year I am setting up a "Give Thanks" jar on the table and asking that everyone write on a piece of paper the things they are thankful for and place it inside. As an added incentive for those that might be a little hesitant to write out their list I have little treat bags with goodies inside for after they are done. Then after we enjoy our meal as a family I am going to read them allowed for everyone to hear. I thought it would be a nice tradition to start, and a nice addition for a page in my family scrapbook. And who better to celebrate Thanksgiving with other than the original creators of Thanksgiving themselves (okay so maybe not the original)....the Peanuts gang! There aren't too many Thanksgiving cartoons out there and I have to say I'm quite okay with that because this one is my favorite. And I am sure you can agree they make pretty awesome table decor. 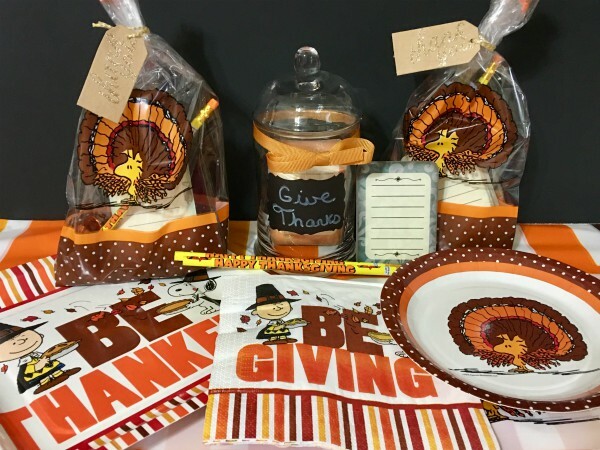 Celebrate the Thanksgiving holiday with festive party supplies and Thanksgiving! Find a variety of decorating themes, including fall, pumpkin and turkey. Get the kids a great holiday activity with a variety of easy-to-assemble Thanksgiving crafts. Create party treat bags with fall-themed treats, kids' stationery and novelty Thanksgiving toys. Choose candy treats for your guests or Thanksgiving mints for the dinner table. Enjoy your family get-together by creating a photo booth complete with stick props, fall accessories and Thanksgiving costumes for the kids! From Thanksgiving home decor to crafts for kids, find plenty of fun ideas at everyday low prices.